MaxTrax ROM Air is designed to increase stability following trauma or post-operative procedures. The cushioned inner/outer soles designed to absorb shock upon heel strike and improve patient comfort. The low profile, Rocker bottom helps promote natural gait and reduce plantar pressures. Provides protected range-of-motion following trauma or post-operative procedures. ROM settings between 45 degrees plantar-flexion and 30 degrees dorsi-flexion in 7.5 degree increments. Uprights will lock in fixed positions of 0, 7.5, 15, 22.5 and 30 plantar- and dorsi-flexion. Better Braces does not carry the XS size of the DonJoy Maxtrax ROM Air Walker. However, the manufacturer DJO Global does make a smaller size. Their phone number is 800-336-6569. Do you have a replacement pump for the Don Joy Walker .the hose broke off the pump. do I need a tool to change the range of motion on the ankle hinge? The hinge itself has a pin that can be removed to adjust the range of motion. No tool is needed. Hello , does this Rom walker can be locked in a position of 0 degrees. For example doing a role for fixed walker in early rehabilitation and then when you are further in the rehabilitation and it´s better if you move your ankle to do a rom walker role. So i mean 1st this walker can do fixed ankle/foot walker like DonJoy Maxtrax Air Walker for example, and latter in rehabilitation it provides ROM to your ankle . This is correct, with the DonJoy Maxtrax ROM walker you can lock it into a fixed position and then as needed adjust the hinges so that it will provide you with more ankle range of motion. The rom settings are betweem 45 degrees of plantar-flexion and 30 degess of dorsi-flexion. Can the liner by laundered? Hand wash, mild detergent and let air dry. There is a small bulb that inflates the brace to reduce gapping. 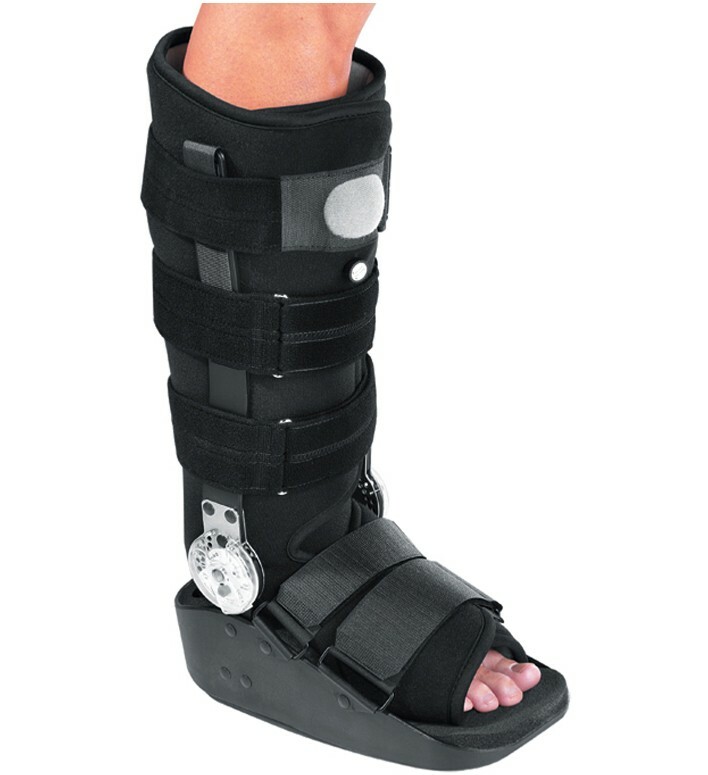 My ortho prescribed a walking cast for my Achilles tendonosis to allow it to rest and hoppefully repair - I did not tolerate a hard cast and am now considering your Donjoy Maxtrax ROM Air Walker. I wear a 10 Wide shoe. Will this be a suitable stabilization for my achilles tendon? Yes, the DonJoy Maxtrax ROM Air Walker is the recommended brace to wear to stabilize and support the Achilles Tendon after injury or post-op. The Maxtrax Walkers are designed to accommodate a wide foot.